My happiest meals are the ones where vegetables take center stage; they're full of color, textures and nutrition. 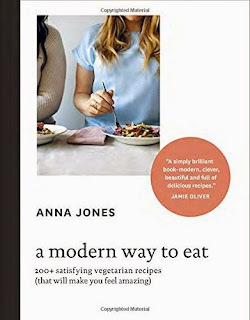 Food stylist and student of Jamie Oliver, Anna Jones has compiled a comprehensive book of not only vegetarian recipes, but also information on individual ingredients and idea generating charts of how to combine foods for maximum impact and flavor. The understated cover and philosophical title of A Modern Way to Eat, I think, was meant to signal that this book is more about promoting a life-style of simple, clean, creative eating that takes advantage of our current knowledge of the benefits of plant-based diets and our access to global ingredients and cooking techniques. And it's right up my alley. It has a good variety of dishes- from breakfasts, to snacks, to light lunches to food for a crowd to desserts and condiments. Lots of full color photos. Not every recipe or quick suggestion is illustrated, but certainly the more intriguing ones are, such as Seeded pistachio and squash galette (198) and Popcorn tacos (131), and Indonesian Gado gado (173) and Goodwill rainbow pie (232). Encouragement to experiment and tinker on every page. Wondering what to do with celeriac or why you might even want to try it? Looking for ten ways to enjoy avocados on toast or four alternatives to the traditional chickpea and tahini hummus? Do you want to know natural alternatives to refined white sugar? Would you like to build one of a thousand variations of a soup in seven steps? (How about vegetable stock + sage + mustard seeds + squash + fava beans + spinach + roasted seeds?) Jones offers lots of fuel for new ideas and combinations. Unpretentious writing style. Jones is not out to wow us with her knowledge or the fact that she's shared counter space with celeb chefs. Nor is she taking the high road that only vegan, gluten-free, dairy free foods have merit. However, she does write invitingly about untraditional versions of familiar foods, such as using cauliflower crust for her Any-night-of-the-week pizza, about which she says: "I'm not trying to pretend it's a normal pizza and that you won't ever want a delicious sourdough margherita again-- you will, because those are unstoppably delicious. But a good a good pizza dough can mean a little too much work for a weeknight. This base is so very easy and healthy, youcould eat it any night of the week with glee. Sounds weird, tastes genius--give it a try" (226). Be aware that this is bound like a fat college textbook. It's 350 pages, and doesn't exactly lay flat. Additionally, the pages are matte finish, which means if you tend to get messy when you cook, you won't be able to easily wipe off spills or splatters. You can probably tell this isn't a quick-n-easy or four-ingredients or less kind of cookbook. It emphasizes whole, unprocessed ingredients and most recipes involve at least a dozen ingredients and as many steps to make. Her recipes really aren't fussy, but what comes naturally for the author, probably would involve a learning curve for the average home cook. Finally, Jones is British. So many of her ingredients are easier to find in Europe than most American towns-- watercress, purple sprouting broccoli and chervil are some examples of less common ingredients. Also, her recipes include both measurements in her original grams and in American measurements. None of these considerations are really negative to me. I love her vision for a modern way to eat, and my stomach is rumbling as I write this review. Overall, I recommend this book to anyone who loves vegetables and is comfortable experimenting and improvising in the kitchen.